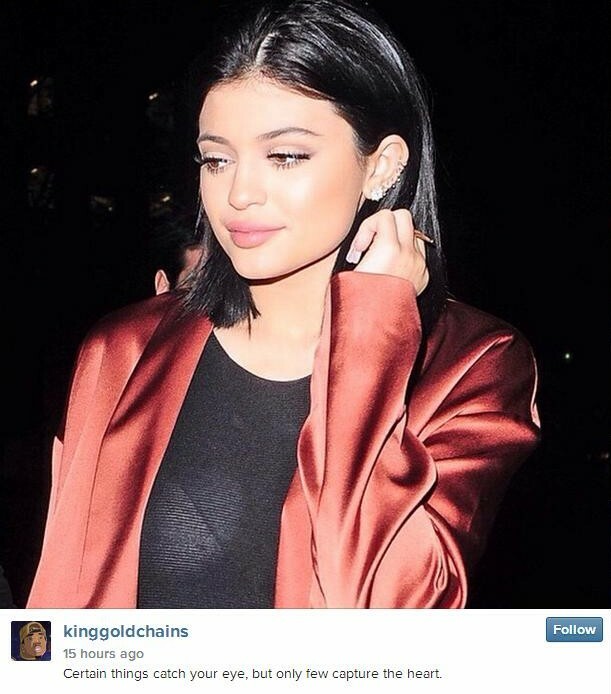 Tyga appeared to confirm his rumoured relationship with 17-year-old Kylie Jenner with an Instagram posting. The pair have long been linked romantically but until his cryptic social media posting on Friday he had roundly denied the allegations. Tyga and Kylie were last seen together leaving The Forum in Inglewood on Sunday after Tyga's concert with Chris Brown and Trey Songz for the Between The Sheets tour. The teenager and youngest member of the Kardashian-Jenner sisters left the arena closely following the Rack City rapper while he walked alongside his entourage. Rumours have been circulating about an alleged relationship since the summer of last year as they were even pictured hanging out while serving food during a charitable Thanksgiving event in LA back in November. As recently as last month the rapper - born Michael Ray Nguyen-Stevenson - insisted he was not dating the Keeping Up With The Kardashians star as he tried to make the point clear during a radio interview with The Breakfast Club on February 17. 'No, I'm not dating Kylie. I wanna be clear to everybody, I didn't leave my family to be with Kylie. That's ridiculous,' Tyga said. 'But I’ve been friends with them before I even met [Blac] Chyna. I was friends with Scott [Disick], her family for years, so me hanging out with them was nothing new. Things seem to be changing pretty quickly for the rapper as he was engaged to 26-year-old model Chyna - the mother of his child - until fairly recently. In October 2012, they welcomed a son, King Cairo. The family set up house in a $6.5m mansion in Calabasas, which is not far from where Kylie grew up in Hidden Hills. In December 2012, Chyna - who is good friends with Kim Kardashian - confirmed they were engaged. They split in August 2014, about the same time he reportedly started spending time with Kylie.